You’ve read stories on the internet about the horrors of riding airplanes with some co-passengers taking off their shoes, even if they have stinky feet, babies crying throughout a long-haul flight, and inconsiderate people taking too much space on the plane’s seat. I’m sure these scenarios will make you wish that you had the money to buy your own private jet. While that’s still a dream, you might want to check out these most luxurious and expensive private jets in the world so you could have something to choose from once you’ve become an ultra billionaire. 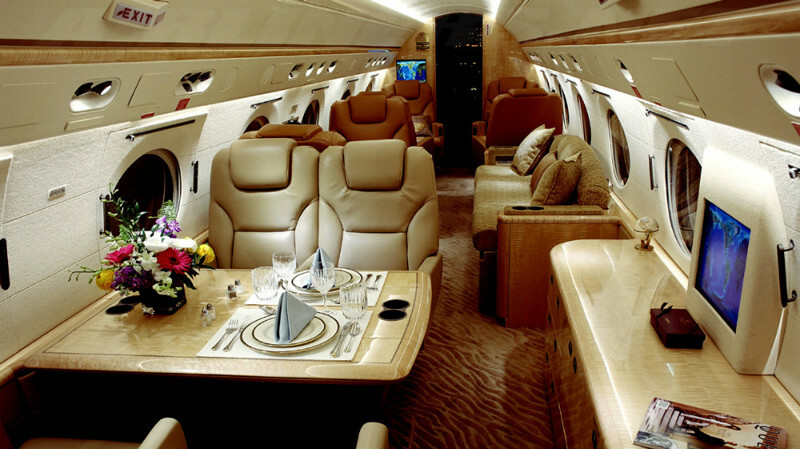 This spacious, comfy, and economical private jet lands 10th on the list of the world’s most expensive private jets. This aircraft can seat seven to nine passengers and can be expanded to 19 passengers when configured. Although this aircraft is considered a private jet, its cabin space can be compared to what the passenger airline Boeing 737 has. Inspirational writer Joyce Meyer is reported to have purchased her own Challenger 600 for $5 million. This medium-size private jet can comfortably sit 10 passengers and would still leave extra interior space — bigger than some jets with the same class as the Hawker 4000. Sergio Garcia, a professional golf player from Spain, bought this private jet for $22 million. It’s reported that he uses the Hawker 4000 to travel to different countries for his tournaments. First released in 2011, the Embraer Legacy 650 is a perfect aircraft for businessmen and celebrities who need to move frequently from one country to another. The aircraft has three separate large cabins, 240 cubic feet for your baggage, a high-tech entertainment system, a galley, and the largest lavatory compared to the aircrafts in its class. 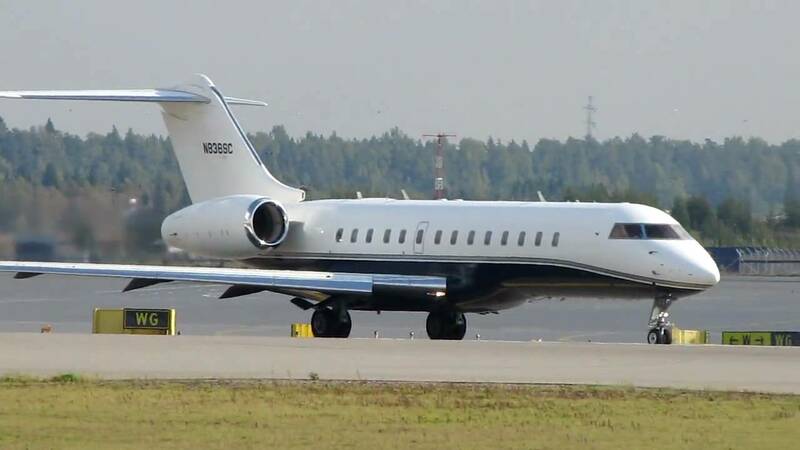 One of the world’s richest celebrities, Jackie Chan, purchased an Embraer Legacy 650 for his own use; he even painted his personal logo using China’s flag colors. This $45 million corporate jet is one aircraft that could bring its 19 passengers to long distances on top speed, non-stop. The richest man in the world Bill Gates owns one of these babies and has reportedly used the jet to fly him to countries for his commitments with regard to his charity foundation. The Sukhoi Superjet 100 that was introduced to the market in 2001 could be the biggest private jet on this list. 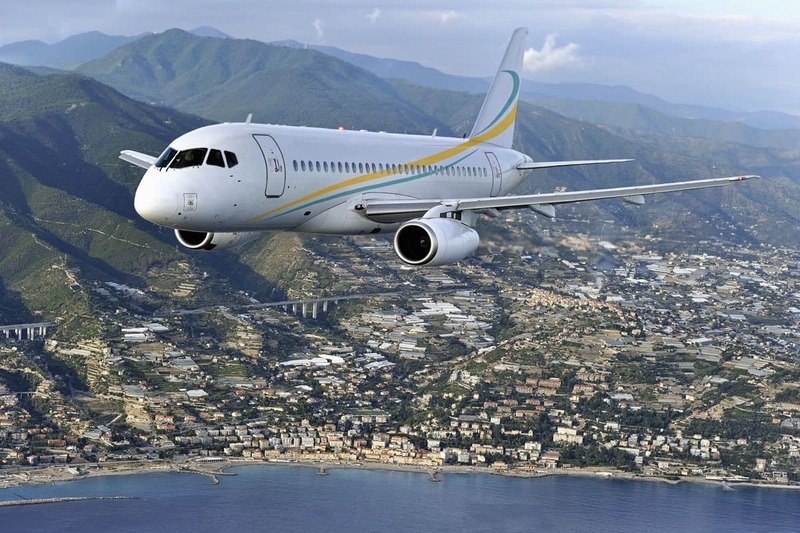 Owners of this superjet can customize the passenger seating of this plane for up to 100, so they could turn this luxury jet into a venue for one of the massive private parties in the air. 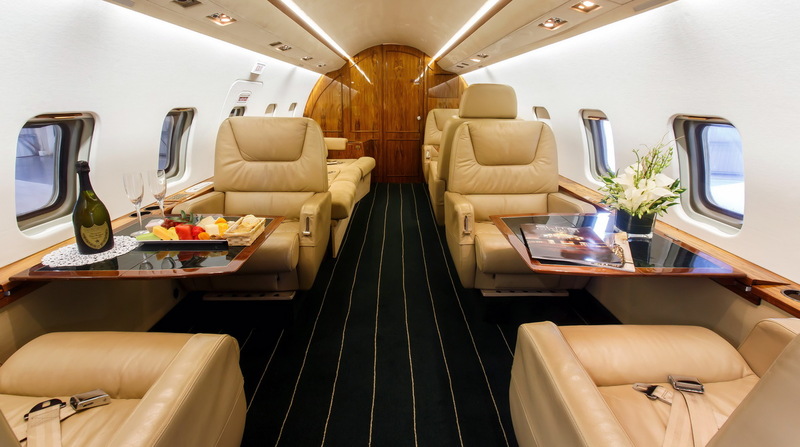 Known as the most economic and eco-friendly private jets in the market, this aircraft could be one of your best choices; that is, if you have $66 million on hand. According to the developer’s website, this jet provides enough cabin space that will keep you comfortable even in long-haul flights (this jet, by the way, boasts that it is the farthest-reaching business aircraft yet) and a spacious galley, plus an entertainment system to enjoy your movies during your flight. 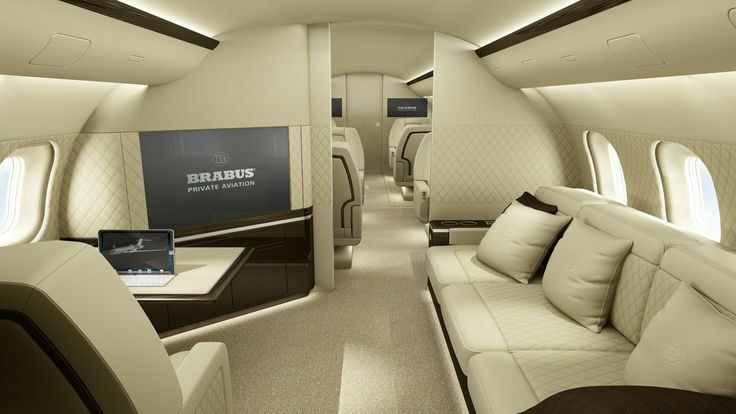 This highly customizable Airbus ACJ319 private jet could be the aircraft of your dreams. At the rear of this plane is a bedroom to make sure that you get your quality sleep even if you’re flying out of the country. 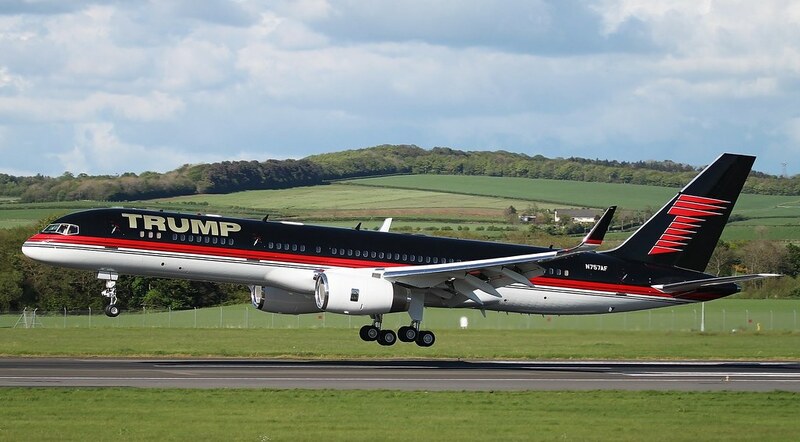 This type of aircraft is usually used for commercial flights; however, if you have the same bank account as presidential candidate and billionaire Donald Trump, a Boeing 757 with gold-plated seat belts might just be your choice for your private aircraft. A one hour flight will cost you more than $10,000, including fuel. During his campaign, Donald Trump spent more than half a million dollar on private travels in one quarter. Donald Trump, pictured here with another privet jet as he was attending a press conference with the american female wrestlers, reportedly bought the Boeing 757 at $100 million from Microsoft co-founder Paul Allen. Trump’s Boeing is covered in gold and has the Trump logo almost everywhere. Thanks to a Rolls-Royce engine, this Boeing is one of the fastest airplanes in the world. It can fly at more than 500 miles per hour. It’s also extremely spacious. Normally, a Boeing 757 can carry close to 250 passengers. Trump’s 757 has only 43 seats! Donald Trump’s plane is equipped with a dining room, a bedroom and a private guest room. It also features a bath with 24-karat gold faucets and seat buckles. Finally, in case you wonder what to do on board this expensive flying toy, Donald Trump’s Boeing has it’s own a cutting edge theatre system equipped with 18 IMAX-level speaker…. and 1000 movies on demand! “A palace in the sky”– this is what most people call the Boeing 747-8 VIP aircraft. One very wealthy client paid a couple of million dollars for this passenger plane, turned VIP private jet to have a built-in dining room, an office, a stateroom, and lounges. Technically, this aircraft alone is only worth $300 million; however, its owner, Prince Al-Waleed bin Talal of Saudi paid another $200 million to personalize his own private aircraft. This double-decker jet has a built-in elevator and its interiors is nothing but, you’ve guessed it, gold! This is the largest private jet in the world. The amenities are nothing short of exceptional. 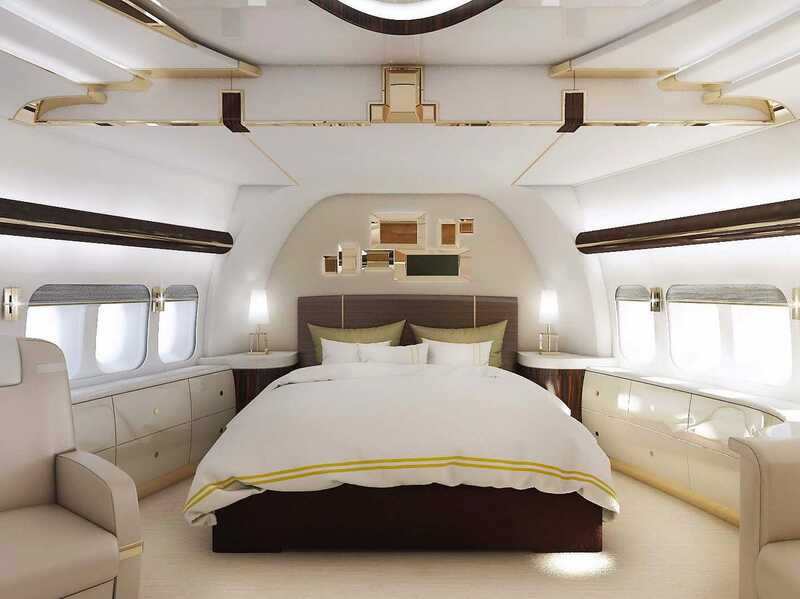 Among other things, this jet includes a lounge, a dining room made with top quality marble, a bar with curtains designed to look like tents of the Arabian Desert, a cinema room, a gym, and a silk bed. I guess it’s called the ‘Flying Palace’ for a reason!